Matteo Salvini has demanded the Netherlands recall the Dutch-flagged ‘rescue’ ships of open borders NGOs, declaring that Italy refuses to be complicit in the “illegal immigration business”. Deputy Prime Minister and interior minister Matteo Salvini hit out at German ‘rescue’ charities operating the Lifeline and the Seefuchs on Saturday morning, noting that the vessels were hanging around the Libyan coast, “waiting to pick up their next load of human” brought to sea by criminal and sometimes terror-linked people-smugglers. 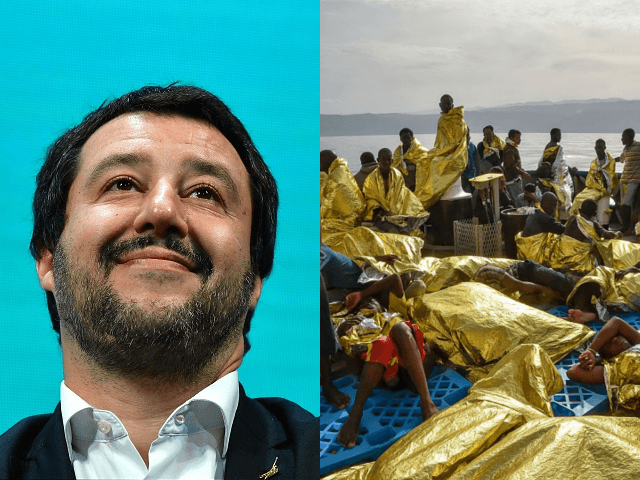 “[The NGOs] know that Italy no longer wants to be complicit in the business of illegal immigration, and therefore they will have to find other, non-Italian ports to go to,” he wrote on Facebook. Mentre Aquarius naviga verso la Spagna, altre 2 navi di Ong con bandiera dell’Olanda sono arrivate al largo delle coste della Libia. Sappiano che l’Italia non vuole più essere complice del business dell’immigrazione clandestina, e dovranno cercarsi altri porti dove dirigersi. Italian transport minister Danilo Toninelli backed the populist Lega leader’s message on Twitter, calling on the Netherlands to recall the vessels, which he accused of being “in violation of the code of conduct” for ‘rescue’ boats on the basis that their insufficient staffing and equipment “could endanger lives”. The row heated up later on Saturday when one of the NGOs waiting on the coast of Libya to collect migrants, Mission Lifeline, called Salvini a “fascist” in a post on Twitter, which has since been deleted. In a tweet which has so-far garnered more than 5,000 likes, Salvini hit back at the so-called charity, posting a picture of a dreadlocked, heavily pierced man with unconventional facial hair and a tiny, dyed pink ‘Mohican’-style strip atop his head. “This gentleman is in the crew of the German NGO ship who, while waiting to load immigrants, called me a ‘fascist’,” suggesting that it was “reassuring” to be opposed by such a person. In another Twitter post, Salvini highlighted a Mission Lifeline appeal for donations written in Italian, commenting: “They take us for dummies, but in Italy the music has changed”. Since migrant ferry NGOs stepped up their activities in the Mediterranean over the past few years, Italy has been burdened with approximately half a million illegal immigrants. The migrant crime rate is at least 35 times higher than that of native Italians, according to a study by Italy’s largest business association, which has caused a great deal of public worry. Italy’s new government has promised to take a much tougher approach on illegal immigration than their globalist, social democratic predecessors, with Salvini telling migrants to “pack their bags” earlier this month.